​Sign Up and get $10 off your next purchase!! BELLEZA ROPA PROVIDES A HIGHLY CURATED SELECTION OF COMFORT-DRIVEN BRANDS. For over 20 years, Alegria has been making shoes for better wellness and comfort. They use bright colors and bold prints to invoke happiness. They make casual wear, professional wear, sandals, wedges, heels, and boots to provide comfort in every aspect of your life. Their signature Classic Footbed is made with specially formulated soft polyurethane, cork, and memory foam and ergonomically designed to fit the natural contours of the foot. The outsole of the shoe is slip-resistant with a mild rocker to be compatible with every surface. The B.ella brand features cashmere and cashmere blends, angora, extra fine merino and alpaca yarns, among others, in some of the finest and most luxurious hosiery available today. Standard Merchandising Co. is a family owned business-the current owners are the third generation to own and run the business. They have been manufacturing in the US since 1922 They have been knitting socks in Reading, PA for over 30 years now, during which time the facility has grown to seven times its original size. It is unique and ever-evolving technology that provides Bernie Mev an unparalleled space in the footwear industry. Bernie Mev puts a vision of flexibility, comfort, and chic into reality with signature hand woven elastic uppers and memory foam insoles, catering to all feet .The technology continues to perfect a shoe that responds to every step taken by supporting the arch, absorbing shock, and rebounding in motion. They continuously move forward in their technological advances with the motivation of total customer satisfaction. Børn shoes are crafted from the finest leathers, selected for their exceptional softness, comfort and durability. Whether burnished to perfection or specially treated to achieve an aged, time-worn patina, their rich, premium-quality leathers give each design a uniquely distinctive finish. Specialty fabrics and materials, such as natural linen and plush velvet, are also featured in select styles throughout the Børn collection. The signature stitching process works together with the specialty padded footbeds and wide, roomy toe boxes to immerse the foot in comfort. From brushed metal hardware to hand-cut tassels and clever accent stitching, Børn’s designs reflect an artful sensibility. At Birkenstock, tradition and heritage are important hallmarks of a brand that dates back not years or even decades, but centuries. Birkenstock is deeply rooted in the fine art of crafting premium quality shoes that are good for you. Since 1774, Birkenstock has passed this commitment down from one generation to the next. The result is the absolute best in quality, comfort and support. That’s because the products are made with deep respect for German and European standards for ethical, social and environmental responsibility. The original footbed is also the most extraordinary. At the heart of every Birkenstock sandal, clog, boot and shoe is the footbed that started it all. That’s right, Birkenstock invented the contoured footbed, introducing the concept in the 1930s for anatomically shaped insoles with incredible support. Since then, many have tried to copy the idea, but there is only one that can proudly bear the Birkenstock name. Nothing compares to a Birkenstock footbed. Step in and experience for yourself the unrivaled comfort and support. After learning the ropes of the apparel industry, Joseph Demirjian launched Color Me Cotton from the garage of his home in Southern California in 1978. 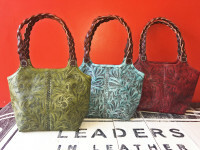 The product is made of natural fibers and a dazzling array of color. It is a fashion statement blended of both American and European influences stemming back to Joseph’s native home of Armenia. The company has evolved into JD-CMC Inc., consisting of two divisions – Color Me Cotton and Click. Now 30 years later, it is still all about comfort and style. The designs are targeted at both baby boomers and Generation X, who appreciate the ease of machine washable and dryable fabrics. The extensive size range encompasses XS-XXL. Cut Loose started in the late 70s as a t-shirt and drawstring pants vendor on Fisherman’s Warf. Since there were no fitting rooms, their clothes were cut loose as one-size-fits-all. They dyed their own fabric in a Victorian claw-foot bathtub, but soon outgrew it. They now have customized machines and computerized dye vats to create clothes in new custom colors, as well as their historic best sellers. Their clothes have an “implied shape,” meaning the clothes skim over the body for a fluid silhouette while still allowing movement. 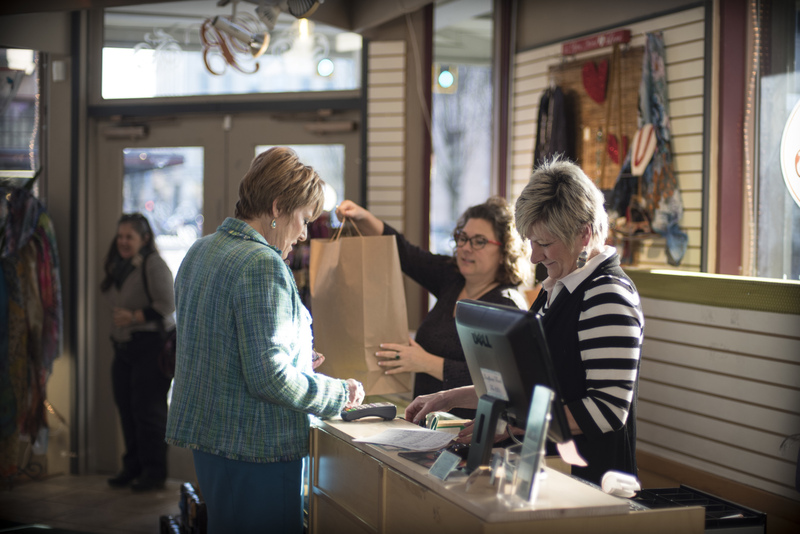 Cut Loose has been in business for over 30 years. They manufacture their products in San Francisco and their employees are offered profit sharing opportunities. Their fabrics are hand dyed and their fabric test samples are repurposed into scarves, napkins, market bags, and scrunchies. They also recycle their other materials, as well as use non-toxic dyes and neutralize waste water to avoid corroding city pipes. Cut Loose primarily uses natural fibers such as cotton knits, linen, rayon made from wood cellulose, and Tencel made from cotton linter. rubber. In his work every small part blends in a complex and ingenious construction method. used to clean the surface. If in need simply use a wet or dry cloth to clean them. favors a more ecological production. Dansko clogs were discovered in a small European store by husband and wife Mandy Cabot and Peter Kjellerup 26 years ago,. As the shoe gained popularity, the comfort company was born. Every pair of shoes they now make includes their legendary Dansko all-day comfort. 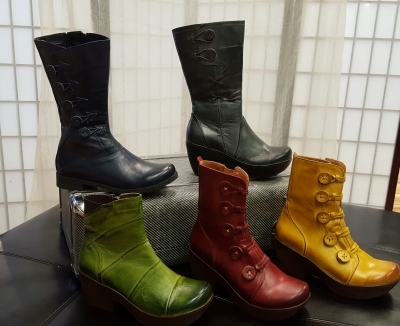 Today, their 100% employee owned company based in the rolling hills of Pennsylvania, offers a complete line of footwear – heels, boots, sandals, wedges, flats, and many, many types of clogs. Every pair is infused with legendary Dansko all-day comfort and support. Every Dansko product made must meet the highest standards for comfort, support, durability, fit, and performance. From initial sketches to final inspection, hundreds of steps take place before a pair of their shoes will make their way onto your feet. Made in Italy, Poland, Mexico and China. Focus founders, Jo and his wife began by selling clothes at street markets before launching Focus Inc. over 25 years ago. They design simple clothing that can be worn for the everyday, but with enough uniqueness to inspire the imagination. Most of their garments are prewashed for ease and comfort. Jo owns the factories they use in Vietnam and makes sure the employees are treated very well. The garments are shipped to the US undyed and are dyed in Los Angeles. Garments are made from cotton and linens. They have chosen fabrics that are linens, soft cotton, knits, and woven. Most garments are prewashed and go through garment dye processes. Focus fashion is easygoing and comfortable by nature and they offer many styles to choose from. All garments are shipped to the United states and are dyed in Los Angeles. Habitat designs are meant to move you comfortably and stylishly through every part of your life. From the office, to dinner with friends, book club to college reunion, their clothes are the ones you can truly live in. Every piece can be dressed up or down, accessorized or stand on its own. Their clothes are sure to be the favorite core pieces in your wardrobe. They stay clear of costumey bells and whistles and ridiculous trends. Instead, they focus on grounded contemporary styling for real women living real lives. Their goal is to enhance your personal style, not dictate it. Timeless fabrics, colors and shapes are inspired by global travel and total immersion in fashion trends and cultures. Their most important design influence, however, is always you. Each and every development decision is made with you, their real live customer, in mind. With more than 40 years of creative experience under their belt, Hot Sox remains the innovator of fashion socks. They pride themselves in creating socks season after season that are cutting edge, creative and bright in design, and the best of quality. Patterned socks continue to dominate in trouser length, knee high and over the knee styles. In true fashion trend, their socks are dominating the market with so much color and design that you’ll need your sunglasses on when you wear these! Hot Sox continues to allow you to express your individuality one step at a time. Hot Sox has continued to evolve with the millennium, gathering inspiration everywhere to keep design concepts fresh and unexpected. And the Sox-clad are certainly receptive. Jag Jeans was started in the 1980s. In the 2000s, their present team of designers was put together. Their jeans are designed by women for real women and at a realistic price. Their design team is located in Seattle and their product ships from Kent, Washington. Jag Jeans are manufactured in China. They are made from cotton, polyester, and spandex. They offer a unique pull-on design with a tummy smoothing panel. Jag Jeans gives back to charitable causes and is involved in the fire fighter and Asian communities. JAFA boots & shoes are designed by exciting young talents from Israel, who take delight in the freedom to express themselves without the restrictions of a mass production facility – no matter how innovative or complex their vision, or how rare the materials needed to execute it. JAFA boots & shoes are made by hand, the way they have been for centuries: with passion, integrity and personal attention to every detail. Their designers employ couture quality leathers: buttery soft and lusciously colored. As well as hands-on construction secrets passed down through the generations, JAFA® boots & shoes enfold your foot like a second skin. Their footwear is created for the woman whose fashion persona stands out from the crowd but whose busy life has no place for painful, poorly fitting shoes. If you are that woman, take a step up to the chic designs and superb, handmade comfort of JAFA. Michael Berg started out as a junk picker 31 years ago. Friends were making jewelry and he started experimenting with glass. He added metal then eventually used only recycled scrap aluminum metal from Boeing. His handcrafted jewelry is made in his studio in Sylvan, Washington. Michael thrives on the reflection and absorption of light, trying to find different ways to hold light. 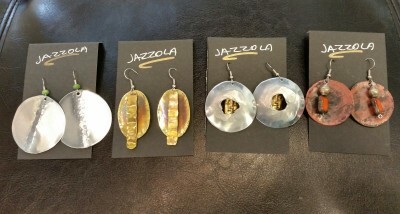 He has been making jewelry for 25 years and is still having fun creating new designs. His secret is using aluminum instead of silver – it polishes the same, textures well, and the color can be changed with heat. If a customer loses or breaks one of their pieces, he will make a new piece or repair the piece at no cost. Kavita started her business of producing silk prints around 30 years ago. She earned a degree in textile design in New Delhi, India before working at studios in Delhi, Paris, and Cleveland. 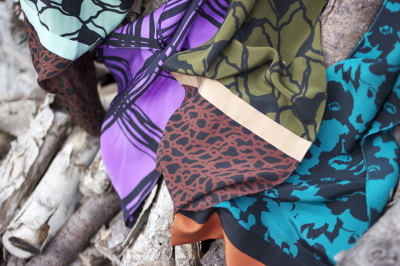 She produces on-of-a-kind silk prints. Designs are first painted on silks then converted to screen prints. Kavita spends most of her days working in her studio on new designs, but makes sure to spend plenty of time with her family and new grandchild. Members of the manufacturing team have all become friends with Kavita over the years as everything is produced locally. Kavita donates pieces of art and silk paintings for charity fundraisers and makes sure her office continues implementing recycling processes. Her products are made of silk, georgette silk, crepe de chine silk, and charmeuse. SlimSations is a classic pant that fits well and won't be outdated within a couple seasons. Every pair of SlimSation pants features a flexible tummy control panel that moves with you while smoothing the stomach and shaping the hips. 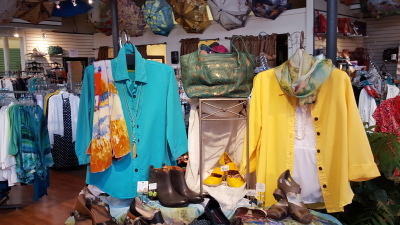 We carry this pant year round in great basics and in the summer in fun brights. Available in 3 lengths and extended sizes. Naot is an international success story. When members of the Kibbutz Naot Mordechai founded the kibbutz shoe factory in 1942 as a one room workshop, no one imagined that in fifty years’ time their shoes would be worn all over the world. The small shoe factory that made simple work shoes and sandals has become an international business and is now Israel’s leading manufacturer and exporter of shoes. The idea originating in northern Israel in the late 1980s, “It’s fashionable to walk in comfort,” quickly conquered the world. Naot manufactures a large variety of footwear with a unique anatomical footbed. The footbed is a “negative” print of the foot, just like the footprint we leave when walking in the sand. It is flexible, soft, shock absorbent, supports the heel, and alleviates fatigue and pain. The footbeds are made of natural cork and latex and are covered in a pampering layer of suede. The uppers are made of high quality Italian leathers. It’s no wonder “Naot” means oasis! They’re a brand by women for women. And they understand how hard it is to find the perfect pair of jeans. You know, the ones you dream about finding, and the minute you slip them on you smile, turn and say, YESSS! But for them, and many others, they simply didn't exist. So they set out to make them — jeans that actually fit in all the right places, that truly flatter your body so you look and feel confident and chic morning to midnight, good day or bad day and every moment in between. look one size smaller. Promise. Their collections are inspired by the recreational activities of a modern day individual, and they aim to captures their spirit through their lines of comfortable and functional apparel. Whether camping, fishing, or simply taking a stroll through town, Weekendz Off provides sportswear that fits both the lifestyle and personality of each individual. They believe that a company’s success starts with its people --- their family of talented men and woman bring their expertise from all parts of the apparel world. From design, merchandising, production, to sales, operation and finance, these hard working individuals continue to deliver exceptional service, quality and value to their extended family of clients and their customers every day. At Weekendz Off, they are dedicated to building the most rewarding partnership with you. They strive to be the best and will continue to build themselves into one of the most respected apparel companies in the world. They concentrate on using fabrics made of mostly natural fibers that maximize comfort and ease of care in everyday life. Their signature fabrics include cotton, Linen, Tencel®, silk, suede leather and cashmere. Specializing in garment dye their range of collections feature knit and woven tops, jackets, sweaters, vests, pants and shorts. From the most technological fabrics, to the most stylish and functional designs, the Weekendz Off design team travels around the globe to bring you top notch quality at exceptional values. Rieker antistress footwear is unique. To maintain the integrity of its special constructions, together with the flexibility to respond quickly to fashion trends, virtually everything Rieker sells is made by Rieker. 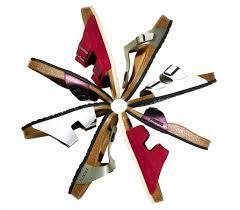 Rieker shoes are not merely decorative, fashionable, products. Their functional features mean they offer much more than that. Every shoe incorporates our special construction and utilises lightweight and elastic components to achieve our special antistress features. Optimum shock absorption on varying surfaces. Maximum reflexibility (what we call the ´barefoot´ feeling). A construction that devotes space to areas where the foot expands through the day. Rieker has been supporting regularly a church operated hospital and school in Latin America. 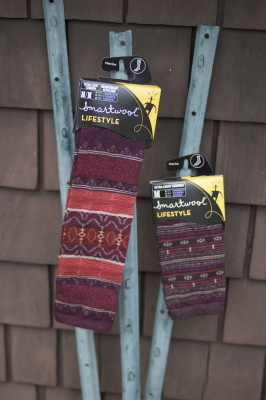 The SmartWool story started on a rugged Colorado ski slope with the belief that toes didn’t have to be cold. One simple pair of Merino socks challenged the conventional wisdom and forever changed the way outdoor enthusiasts looked at their feet. It’s not just about the Merino, though. It’s what they do with it that makes SmartWool different. For over 20 years, they’ve been pushing the boundaries of Merino to create smarter, more capable products from head to toe. Their love of the outdoors runs deep. Through the SmartWool Advocacy Fund, they support organizations that aim to protect the natural environment and create opportunities for future generations to get outside. Designed in Southern California, Taos shoes feature adjustable uppers, anatomical footbeds, and artisan finished leathers. They do their best to leave the smallest environmental footprint possible by taking actions such as recycling, having as little scrap material as possible, and using soy-based inks on their recycled stock shoeboxes. 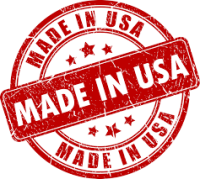 Taos shoes are produced in Southern California at their on-site facility and at premium manufacturers around the world. Some of their leather uppers involve hand-crafting. They are a strong supporter of the ASPCA and Humane Society in support of the fair treatment of animals. Only high quality suedes, leathers, and other materials from humane sources are used for their shoes. Created in 2005, Taos Footwear was born from a simple idea: to give women stylish and comfortable footwear. Celebrating their 10th anniversary in 2015, this commitment to style, comfort, and quality remains their guiding principle. The DNA of Taos Footwear is easy to see, but difficult to duplicate: adjustable uppers, anatomical footbeds, and artisan finished leathers. was an early pioneer of garment dyeing in Los Angeles, California. In 1992, Steve launched the “Tianello” brand as the premium collection using natural fibers such as “Bemberg” and “Tencel” and recently adding cotton and silk. All fabrics have a soft as butter hand, are distinctively textured and beautifully printed. In 1994 Steve opened a manufacturing facility in Los Angeles. The location serves both as headquarters and production, providing consistent maintenance of the brand quality. Today he has over 180 tailors and finishers who cut, sew, and finish all of his products. Tianello is made in the U.S.A! Before a style goes into production, Steve approves every detail. Today, Tianello is known for its timely fashion sense, design detail, distinctive fabrics, excellent fit and a “feel good experience” that is contagious at retail. Yest is spontaneous, unique and affordable. Yest is everywhere and original, but also in the moment. It is fashion for the trendy woman who knows what she wants and enjoys living life for today. With eight new collections per year, keeping your fashion up-to-date has never been easier. Yest is available in Plus Sizes. Yest is based in the Netherlands.